More and more people realize that nutrition is among the important factors that significantly influence human health, thus the length of human life. That is why accurate and detailed information on quality of food and food ingredients are more and more important. Not only producers but also regulatory authorities try to adapt to such requirements and create conditions, where such data is easily and comprehensibly available on each sold food. However, there is still the question what information is necessary to be stated on packaging and how detailed it should be. The rules for labelling of food must balance between enough information on one side and overloading of customers with data on the other side. What data is required for the consumers, what are they interested in and what are they actually able to use? Compromise and solutions that are suitable for everyone need to be found. The European Committee made the essential breakout in food labelling by the Regulation No. 1169/2011, by which the consumers are provided with obligatory information on food ingredients, allergens, quantity of food, shelf-life, way of storage and possible adverse effects together with name of the operator who is responsible for food safety and quality. This should allow consumers to get the most important information right from the food packaging. It is more complicated with unpacked food where consumers must be informed otherwise. Here the ways of how to inform consumers in the point of sale were set by legislation. It is defined what necessary information must be in close proximity of food, what is sufficient to be visibly displayed in the point of sale and what information must be available on request. Sellers can use modern technologies to help them solve these requirements in unpacked food. The latest trend is to provide such information using electronic systems such as QSL's Infobox. (www.infoboxqsl.cz). These systems enable display of detail information on complete range of food products without any need to install spacious information boards or listing of data on food in the point of sale. On 13th December 2016, the last part of the European Union Regulation No. 1169/2011will come into force; under this regulation almost all food packaging must indicate 7 particular nutrition data: energy, fat, saturated fatty acids, saccharides, sugars, protein and salt. Producers have principally two options how to gain nutrition data of their products. First it is using a laboratory analysis that is, in most cases, time consuming and costly. Another method is calculation of the nutritional value of food products, which is much easier than laboratory analysis. However, in this case emphasis is put on practice and knowledge and at least basic knowledge of chemistry of food. That is why even this option can be demanding or be affected by errors. 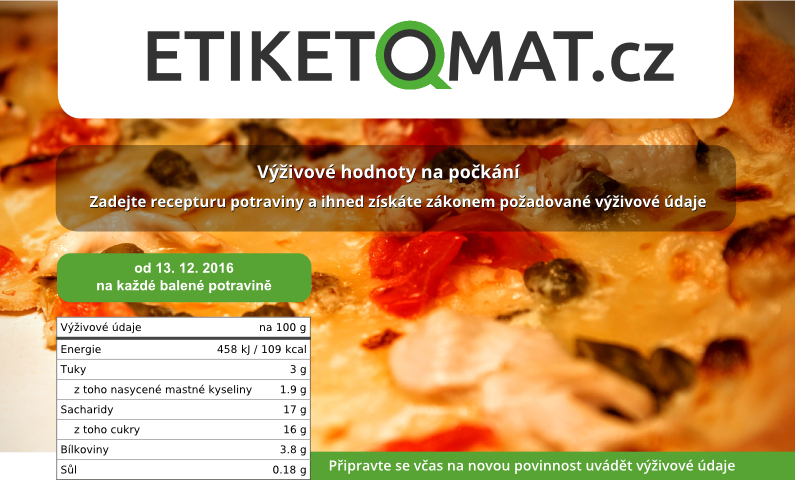 QSL s. r. o. has developed Etiketomat (www.etiketomat.cz), Internet application, that calculates seven nutrition data for given food fast and correctly, that is based on its recipe, information on input raw materials and their technological processing. The food database of Etiketomat was established by compilation of four national databases (Czech, Slovak, English and Danish). Data was primarily collected from the Czech food database (to maintain regional proximity), which is administered by the Institute of Agricultural Economics and Information together with the Food Research Institute Prague. If some values were missing in the Czech database, they were taken, in the following order, from the following databases: Slovak (Food Data Bank of the Food Research Institute), English (CoFID Database) and Danish (Food Data Database). The Etiketomat database includes also many foods that are not included in the Czech or Slovak databases, so it is more comprehensive. As the reference material for comparison QSL s.r.o uses the 8th issue of Food Composition and Nutrition Tables of 2016 authors: Souci, Fachmann, Kraut. 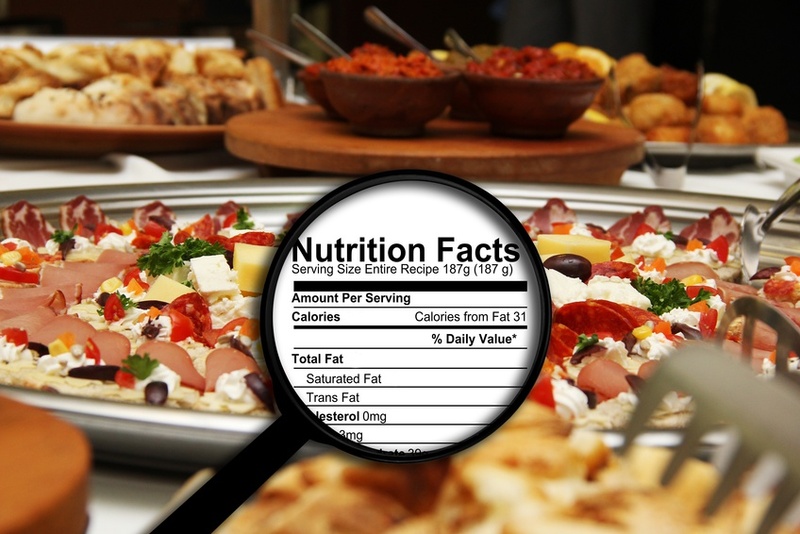 The calculation of nutritional value of food is partially based on the procedure of Eurofir (European Food Information Resource) that is an international non-profit organization with its main aim being, among others, development, management, publishing and using of data on food ingredients. Etiketomat swill calculate the product nutritional value on the basis of the weight of input raw materials and information on their technological processing that allows to take the change of weight occurring, for example, during culinary processing of input raw materials into account. The output of the calculation is the table of nutritional values containing seven obligatory nutrition data; users can save or print the table and further work with it. Nutrition data in the table is expressed per 100 g of the food. Etiketomat can calculate nutritional value of simple and more complicated food products. For food producers and sellers Etiketomat represents a fast and reliable tool for calculation of nutritional value of food products. Another advantage of Etiketomat is its cost (compared to laboratory tests) that is in tens of Czech Koruna, than the fact that producers , do not have to provide any third party with information on their product recipes. As the deadline for obligatory indication of nutrition data on food packaging is approaching, i.e. 13th Dec. 2016, food producers and sellers should change the labels of their products sufficiently in advance; Etiketomat is an appropriate tool to achieve the change. Although the development in the field of labelling of food products has not certainly finished yet, modern technologies can be a useful aid for solving the issue of food labelling that is more and more complicated. New IT solution can provide the customers with all required information and make solutions for fulfilment of legal requirements easier for producers and retailers.